As a collector and admirer of antique and classic cars, Mark Pieloch has a fair amount of experience in managing auto-restoration projects. During the initial stages of any major restoration, it’s critical to perform a full inspection of the vehicle to identify any major mechanical problems and to compile a list of required repairs and replacements. In most cases, restoring an antique vehicle is not a profitable undertaking: It’s a labor of love. Nonetheless, aspiring restoration experts should have a clear idea of the expenses required before beginning a project to ensure they have sufficient funds to complete the task properly. As part of his extensive antique and classic car collection, Mark Pieloch has acquired a beautiful 1957 Mercury Turnpike Cruiser convertible that was used as a pace car for the Indianapolis 500 race. The Turnpike Cruiser was manufactured for the 1957 and 1958 model years and was available as a convertible during 1957. Designed specifically to serve as the pace car for the Indy 500, the Mercury Turnpike Cruiser convertible was later released for purchase by the general public. This elite sports car was painted a characteristic bright yellow that set it apart from its competition and ensured maximum visibility on the track. Mark Pieloch is a longtime fan of Don Yenko and the vehicles he created during his 25 years in the performance modification marketplace. Yenko is known throughout the automotive industry as a leader in creating outstanding sports cars for auto racing and for use on public roadways. He began his second career in 1957 when he opened a shop catering to Chevrolet owners and dealerships and providing high-performance replacement parts and modifications for Chevy vehicles. Mods available from Yenko’s shop included steering enhancements, bodywork and upgraded engines. His technicians also performed transmission upgrades and installed aftermarket positraction, a limited-slip differential that provided improved traction on uneven terrain. It was Yenko’s work with the Chevrolet Camaro, however, that brought him national attention and acclaim. When the Camaro was initially released in 1967, Yenko immediately began replacing the 6.4-liter engine with a 7.0-liter big-block V-8 lifted from the Corvette. This engine was capable of generating 430 horsepower and 460 pound-feet of torque, making it one of the true powerhouse engines in the marketplace at that time. Big-block V-8s were extremely popular among performance-minded buyers, and Yenko did a booming business in these modifications. He also worked on Novas and Chevelles and created a category of sports cars known colloquially in the automotive world as Yenko Super Cars. 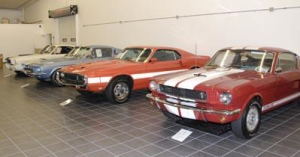 Don Yenko’s legacy lives on in the Pieloch Classic Car Collection and continues to have an impact on the collector car market to the present day. Car enthusiasts like Mark Pieloch continue to honor Yenko’s memory by preserving the elite cars he created for future generations to enjoy. As a serious collector of antique and classic cars, Mark Pieloch has chosen to focus his collection on American vehicles. By narrowing the range of the Pieloch Classic Car Collection primarily to the elite muscle cars manufactured during the 1960s and 1970s, Pieloch can highlight the exceptional quality and styling of these powerful vehicles. Automakers like Ford, Chevrolet and Dodge created a new paradigm for U.S. vehicles and created the enduring legend of the open road. Most experts trace the birth of the American muscle car to the 1964 Pontiac Tempest GTO. Based on the existing Tempest model and designed by John DeLorean, the vehicle featured a package of upgrades that included a powerful V-8 engine. This enhanced power plant produced 350 horsepower and could accelerate from 0 to 60 miles per hour in less than seven seconds, making it one of the fastest cars available at the time. In 1966, the GTO was released as a standalone model and received critical and popular acclaim in the automotive world. Although the heyday of the muscle car was during the 1960s, advances in engineering have allowed even better acceleration and increased power for many modern vehicles. The Pieloch Classic Car Collection incorporates popular vehicles manufactured during the 1950s, 60s and 70s with a few elite cars of more recent vintage. Pieloch’s ongoing work in preserving and collecting these vehicles will allow future generations to explore and experience the beauty and power of classic and antique American cars for many years in the future.